One of the goals of the present Board of Education is to provide all members of the Sag Harbor School District and community with opportunities to communicate with their elected officials. To that end, we have established an email address so that you may submit questions, concerns, suggestions, and compliments. Please send your message to boe@sagharborschools.org. All Board of Education members will receive a copy of your submitted message. 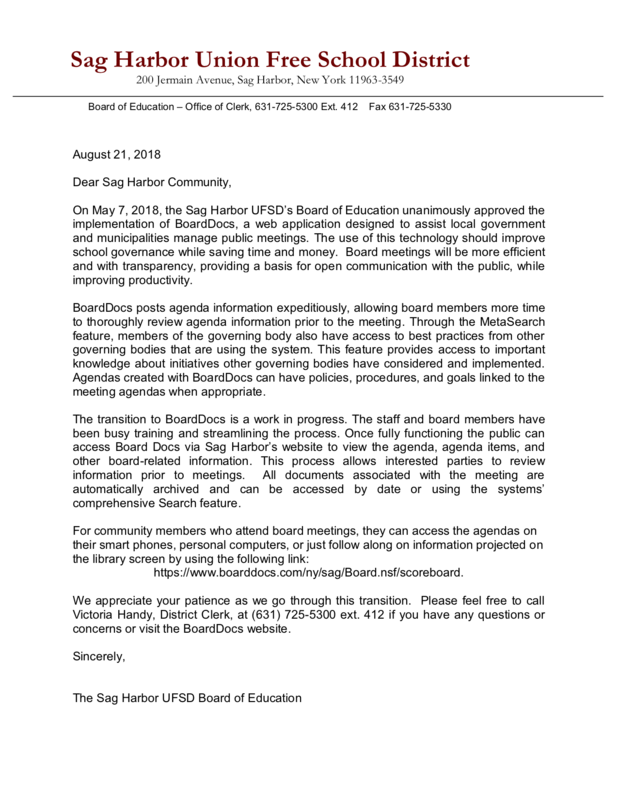 The Board of Education does not respond to the questions or comments posted to this email address on an individual board member basis. The Board will respond to the questions that are appropriate questions for the board level as a political body that speaks with one voice. Those responses will be given in public at a board meeting. After the board meeting, the official response will be emailed to the sender and posted to the District's website. Sometimes, it is more expedient and appropriate to send questions directly to the classroom teacher or the appropriate administrator, rather than the Board of Education. We encourage you to review District Policies numbered 3220 and 3230 dealing with community relations.